Featuring an arched top and beveled corners, the Barcelona upholstered headboard and low footboard bed makes a beautiful addition to any home. Select from three upholstery styles: single body fabric (pictured), body and accent insert fabric or leather. Additionally, you can choose to add button tufting, contrast welts or nailhead trim (available in both brass and nickel) to your custom bed frame if desired. Finally. select your desired wood finish from thirteen different finishes for the exposed wood feet. This bed is available in Twin, Full, Queen, King and California King sizes. 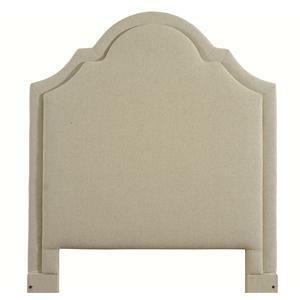 This bed can also be ordered with a tall footboard if preferred. The Custom Upholstered Beds King Barcelona Upholstered Headboard and Low Footboard Bed by Bassett at VanDrie Home Furnishings in the Cadillac, Traverse City, Big Rapids, Houghton Lake and Northern Michigan area. Product availability may vary. Contact us for the most current availability on this product. 1998-R69F 6/6 Barcelona Low FB 1 80" 5.5" 15"
1998-H69F King Barcelona Upholstered Headboard 1 80" 3.5" 64"
The Custom Upholstered Beds collection is a great option if you are looking for Transitional furniture in the Cadillac, Traverse City, Big Rapids, Houghton Lake and Northern Michigan area. Browse other items in the Custom Upholstered Beds collection from VanDrie Home Furnishings in the Cadillac, Traverse City, Big Rapids, Houghton Lake and Northern Michigan area.